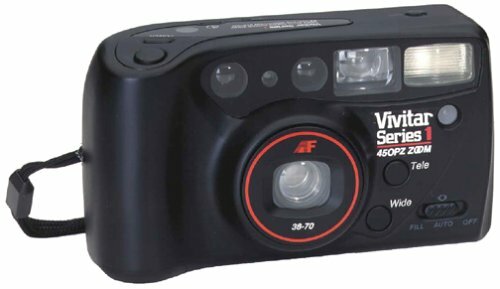 The Vivitar 450PZ Camera is a compact 35mm camera with fully automatic features. 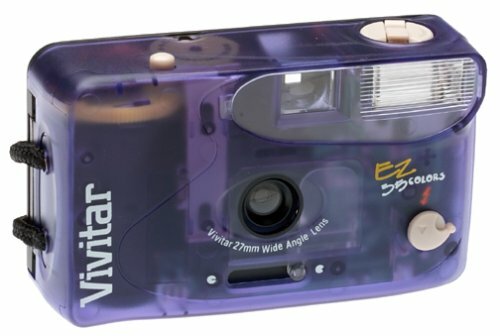 Since focusing and exposure are automatic, operation of the Vivitar 450PZ is trouble-free, even for photographic novices. Its fast 38 to 70mm zoom brings objects up to two times closer. Also featured is an automatic flash with red-eye reduction. The flash fires in all dimly lit situations unless it is turned off, such as for museums or the theater.The Vivitar 450PZ also features motorized film loading, advance, and rewind with midroll rewind possible. An electronic self-timer with a flashing LED indicator enables you to be a part of your pictures. I was very disappointed when the camera arrived. It was large, clunky and unattractive. I did not try the camera, rather just sent it back. A definite case of you get what you pay for. Find something else! 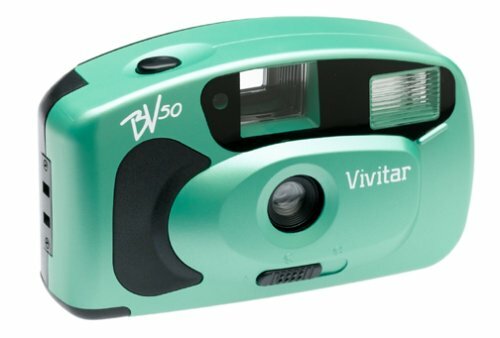 Compact and stylish, the Vivitar ViviCam 20 is a fun camera that is equipped with a focus-free lens and optical viewfinder. 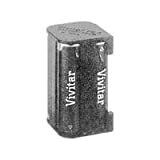 The Vivitar produces photos that are 640 by 480 pixels in resolution, ideal for Web sites and e-mailing. The built-in 8 MB memory can store up to 70 images and you can keep track of this and other functions with the easy-to-read LCD status display. The macro mode comes in handy for special close-up shots, and the 10-second self-timer is useful for group photos and self-portraits. I've figured out the problem with the camera not turning back on. I had the same problem, took it apart, and it didn't take long to realize what was going on. The battery connectors were VERY dirty and corroded with something. Clean them with a little rubbing alcohol on a q-tip and you're good to go. NOTE: You don't have to take it apart to do this, but I did to discover it. I have had this camera for three years and have never had a picture worth printing. The pictures are always blurring, they are ruined by lighting from the outside. The photos are terrible!! Don't buy this camera. I am online now to find a new camera. This one was a waste of my money!!! We have had this camera for a year and have yet to get it to work...even after calling tech support. Finally, after reading the reviews on this site I see that the problem is probably that we're running Windows XP. 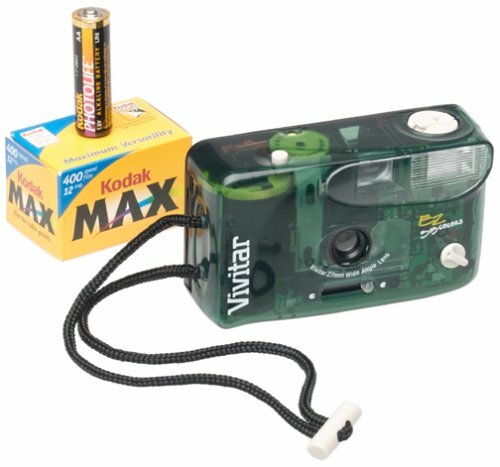 Even if we could work around the software problem, the camera will not turn on any more...even after changing out the batteries. 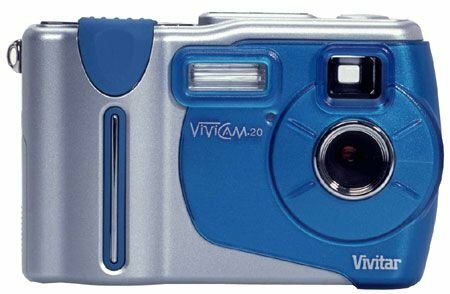 I bought the ViviCam 20 and cannot use on my computer with Microsoft Windows XP. They tell me it could damage my computer now or in the future if I use it. The first camera had a faulty lens -- distant objects were unacceptably blurred and focus was not even across the frame. Also the body was coming apart at the point where the wrist strap is attached. Focus on the replacement was much better, however that camera stopped working within hours. Luckily the third unit provided by the store has worked perfectly for a month now and I am very happy with it. Colour is always excellent and image quality is as good as you will find on a relatively inexpensive VGA resolution camera. There is none of the unpleasant artificial sharpening that I've seen on other 640x480 models. Low-light performance is also a pleasant surprise (for a CMOS-based camera) with good results in bright indoor lighting. The built-in flash also works well under these conditions -- just filling in the shadows enough. Shadows start to 'block up' when light-levels are lower, but even these shots have a certain gritty charm. 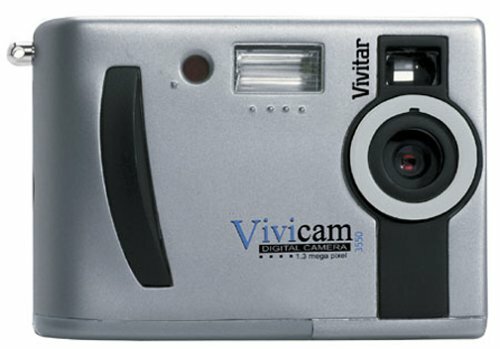 The camera stores up to about 60 VGA images on the internal memory. The different settings for sunny, cloudy, indoor bright and indoor dark seem to have no effect on the resulting images whatsoever. If you don't use the flash much, the batteries appear to last for ever. I've taken around 500 images so far (maybe 25 flash shots) and the two AA batteries that came with the camera are still going strong. There is a macro facility that focuses at about 12 inches from the subject and the switch can also be placed in an 'onofficial' midway position to focus better at around 24 inches. Which is good for taking shots of yourself with the camera at arms length. However, when used as a streaming webcam it seems to slow down a p200 way too much. The camera is too noisey. It bleeps when you take a shot and when selecting options, it bleeps each time you click past a different setting. On self-timer it bleeps a countdown which increases in speed -- about twenty bleeps by the time it actually takes the picture. This is quite funny but an embarrassment in some situations and makes the camera unusable in many public places. The auto-shut off is a bit too fast. The problem is that this also resets all the settings. Which is annoying if you are preparing to take a self-timer shot or waiting for something to happen. The tripod socket is a welcome extra. The camera has stylish good looks and is extremely compact. Transfer of images to PC is simple and fast using a USB cable. Pictures look excellent if reduced down to about 400 pixels or under and sharpened slightly -- for use on a web page for example. This is the ideal snapshot camera for any web designer. This is a very simple camera to use! I am completely pleased with it. Loading the film is a breeze and using the zoom feature is very simple. The pictures are clear and bright. 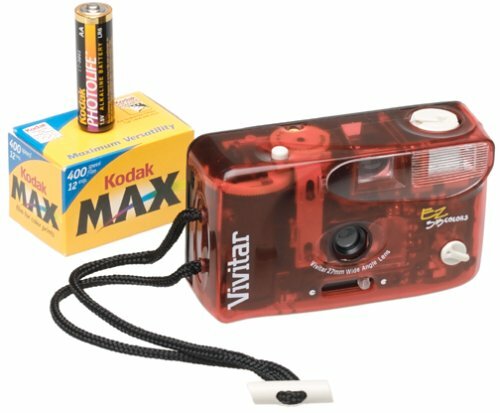 I have had no trouble using this camera. It's lightweight and looks great! 3X Digital Zoom brings reluctant subjects in close! I bought this primarily for eBay auctions. It performs adequately, but "battery hungry" is this camera's middle name. Battery life is about three hours total, a bit longer if you avoid using the display and flash. It does take good pictures, but only with sufficient ambient light. The flash tends to wash out the image, and the red eye feature is useless. I was told you can't get a really decent camera for under $150, and that is apparently true. I bought a cheap camera, and that's what I got. 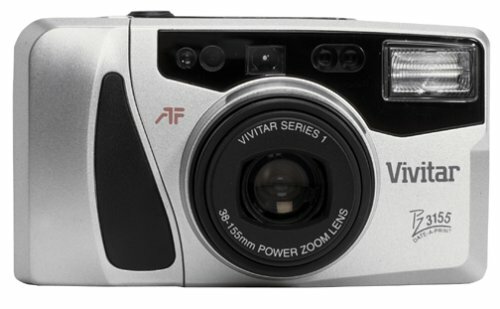 This is a great digital camera for anyone. I just got it and it works wonderfuly. the pictures for me come in really clear. this is a real good deal. The only reason i gave it 4 stars is because it uses the batteries pretty fast. Other than that its really good. I got this for x-mas a year ago, and so far I have been satisfied. It has good quality with light, and if you don't have light there is a flash. The batteries do drain kind of quick. But it works good for me, and I use it for simple photography. This camera could have been great if the lens was of a decent quality. Unfortunately, objects that are relatively close or object at infinity focus are fuzzy. Even at the optimal range for the lens the images are just not good. I realize that fixed focus lenses have their limitations, but this one is definitely much much worse than other fixed focus lens cameras that I've used. Steer clear of this camera, even if you find it cheap at a garage sale. Have recently purchased this lens for my Maxxum St si. The lens weighs much heavier than the Minolta 35-80mm lens which came with my camera but covers a much extended focal length range, possibly all that I would ever want to shoot within. The focusing rings turns as faster as the oneon the smaller lens did. Though the lens dwarfs the relatively smaller ST si camera body but the overall look of my camera is impressive. Hope the wide focal lenght coverage will equally have a premium optical quality. 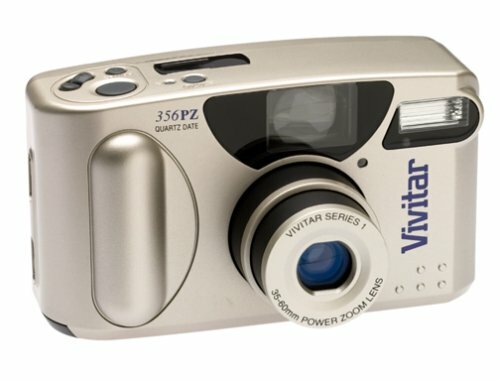 I recently purchased the Vivitar V-2400GX Video/Photo Tripod. When i opened the box it was a small but light tripod that was easy to carry. As soon as I get something i like to try it out so guess what! I un-did the clips and let the legs extend to a hight of 60". 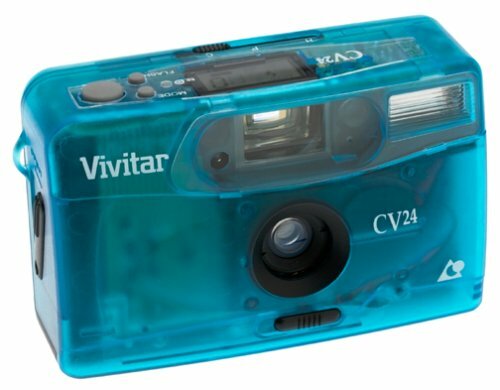 It even has a bubble aligner so your sure you have the perfect video. There are lots of screws to hold the components in place so to turn the head you have to loosen the screw and then turn it. If your an ameteur or professional photographer and were looking for an inexpensive tripod here you go. I use this tripod with 7th & 8th grade students using a digital camcorder to make i-movies. It's held up well and I'm planning on purchasing another so they don't need to argue over who's turn it is to use it. Very easy to use. The built in level bubble is a plus. Very adaptable height wise. This is not a heavy duty professional tripod, but then again, it does not have the heavy duty professional price attached to it either. It is engineered for use with almost any type of camera and its compact size makes it the perfect tripod to take along anywhere. It has a weight of only a little more than 2 pounds and has a folded length of 22 inches. With an extended height of 60 inches, it is perfect for almost any application, including portraits and landscapes. This tripod has some professional features, like the bubble level, 3 way panhead, accessory hook. The flip lever leg locks allows for easy and quick setup/takedown. A tripod doesn't have to be that complicated, just hold the camera steady and secure. This tripod does the job. I can't find much difference between this tripod and one costing ... more. 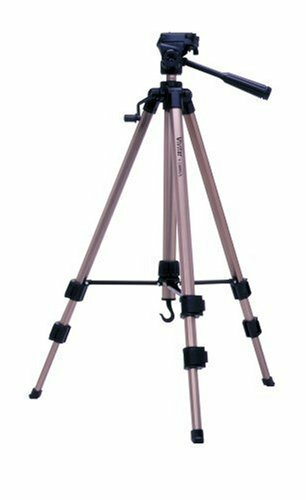 For an entry level tripod, or just the weekend photographer, this is a great tripod to have and transport! Yes there is a risk of stripping gears but I haven't had that happen. It's a decently priced, portable and sturdy piece of equipment. Maybe not the top of the line a professional photographer would buy but definately good for hobbyists or general users who just need a tripod and want one that will a) stand up without wobbling b) not cost and arm and a leg. It is fully adjustable in pretty much every way you could expect as well. Lift flip switch and rotate till your hearts content.